Depression is one of the most common mental disorders in the United States, affecting around 9% of adults on average. Depression is a serious mental illness that is characterized by the constant and intense feelings of sadness, hopelessness, and apathy. Depression can interfere with everyday tasks, and significantly affect personal relationships. Depression develops over time and is most likely caused by a combination of genetic, environmental, and psychological factors. Women are twice as likely as men to develop depression. About 1 in 5 women develop depression at some point in their lives, and can affect women of all ages. Depression most common in women aged 40-59. This is most likely due to the hormonal fluctuations experienced during menopause. Estrogen significantly affects the brain's regulation of moods and emotions. Older women going through the menopause transition are at higher risk of developing depression because their estrogen levels are considerably lowered during menopause. Other factors that can trigger depression in older women include: retirement, death of a spouse or loved one, children leaving home, and dealing with chronic illness. Depression in older people is often overlooked and left untreated, because many people think it is a natural part of aging. Girls and boys experience depression at about the same regularity before puberty. By adolescence, however, girls become more susceptible to depression than boys. This also can be directly linked to the hormonal changes girls experience around this time, which has been shown to sharply increase the likelihood of depression. Studies have shown that girls are more likely to doubt themselves and feel bad after experiencing a difficult situation than boys. The studies also showed that girls also tended to need a higher rate of approval than boys, making them more likely to develop depression. It is important to be able to recognize the symptoms of depression, in order to detect the illness early on. 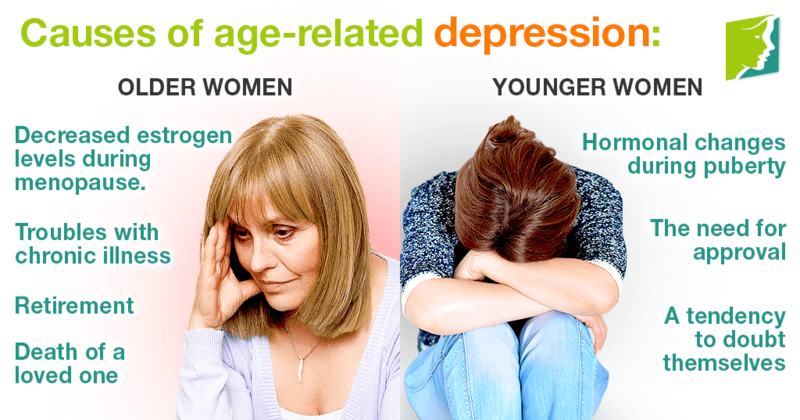 Depression symptoms can be categorized into physical and emotional, and typically are the same among women of all ages. Physical symptoms of depression can include: fatigue, insomnia, changes in appetite, body aches, cramps, and headaches. Emotional symptoms include: thoughts of suicide, irritability, apathy, and feelings of helplessness, guilt and worry. If you think you are suffering from depression, it is crucial to seek professional help immediately. Contacting a doctor and getting properly diagnosed is key to seeking the treatment that is right for you. Talking with a professional counselor and taking anti-depressants are among the effective treatments for depression. Additionally, exercising regularly promotes health benefits, like: improving mood, improving sleep, increasing energy, and reducing stress. Having a solid support system is also key to helping with depression. Surrounding yourself with loved ones and talking to them regularly in order for them to understand what you are experiencing can help lessen depression. Depression is a serious mental illness that should be treated as such. It is important to have a better understanding of what depression is, its causes, and how it affects women of different ages. The main cause of depression in women is hormone fluctuations experienced after puberty, specifically during times of menstruation, pregnancy, and menopause. Unfortunately, depression does not usually go away on its own, so it is crucial to seek professional help if you think you are suffering from depression.